Women Now vigil in remembrance of Jo Cox MP. Women Now. All rights reserved. From the outset of the crisis, women have played a significant role in challenging violent and extremist agendas inside Syria. However, the difference between Syrian women’s definition of extremism and that of the international community is deep: for Syrian women, every act of violence committed in the war is 'ideological and terrorist' in nature, constructed upon the logic of the extermination of the 'other'. Based on this approach, female activists have led protests against all kinds of dictatorship and terrorism, from the Assad regime to ISIS, while also risking their lives to protest and lead campaigns for the liberation of detained prisoners, and against child recruitment. Some of these stories have been heard; some were documented in a 2015 Badael report. Many other stories have not made the headlines. Yet the last thing that those of us working in the field of women’s empowerment inside Syria want is to be instrumentalised by foreign agendas or to be perceived or portrayed as such. There are factions on many sides of the conflict that will seek to delegitimise and slander our activities. Regime representatives may accuse us of being fronts for extremist opposition factions. Conservative elements within the opposition are opposed to our vision of women’s rights and human rights, and the interdependence of the two. Yet international actors have also wittingly or unwittingly contributed to this politicisation of women’s rights in Syria. While writing this article I have witnessed the rollout of a new trend in the international community: 'women on the front line of countering violent extremism'. I know very well the role of women in countering terrorism and extremist thought through children’s education in authentic religious texts on peace and coexistence and I highly recommend the support for those efforts. I have even criticised the international community’s confusion of religion and extremism and the ignorance of the role of religion in community resilience. However, I’m completely astonished at the expectations of the international community, which pushes women to the frontline of countering terrorism, but then ignores them as they call to stop the bombing, stop arming, break the siege; when they cry that fighting extremism cannot be done by arms and airstrikes: an ideology of hate can only be defeated by one of solidarity and justice for all; when they demand justice and accountably; when they request support for the education of children and youth. The international community that disregards all these calls – and then expects women to have a solution to the mire created by militarisation, the lack of accountability and the decline in education, which only put women in more danger. It is important to note that the only impact visible to Syrian civil society organisations (including women’s organisations) of counter terrorism law has been to slow down financial transactions. Vital funding is being stalled for months before reaching Syrian organisations; women activists are left in acute financial need while some projects are left to completely fall down because of this. Another impact is the vetting process, which prevents any individual from being paid without being thoroughly vetted beforehand. What kind of impact can this have? When one of our women’s group recently lost a colleague, killed by an airstrike, the donors refused to compensate her family or pay her salary to her family under the rationale that neither the husband nor any other family member who might benefit from the $200 were vetted. It is possible for women and men activists to die, to suffer from severe trauma without any health insurance, working as heroes under terrible living conditions without any protection or compensation due to counter-terrorism measures. Concerning the instrumentalisation of the fight against sexual violence, an example would be the visit of the UN Special Representative of the Secretary General (SRSG) on Sexual Violence in Armed Conflict in March 2015. Women Now For Development, along with other Syrian women’s civil society groups, organized for the SRSG to meet with survivors of sexual violence in Lebanon and Turkey, alongside her visit to Damascus. The vast majority of the women that the SRSG met had endured horrific forms of sexual violence, and other forms of torture, at the hands of the Syrian regime. (The number of women killed during the conflict between 2011 and 2015 is 18,457 by the Syrian regime (96%), 427 by opposition groups (2.2%), 211 by ISIS and other extremist groups (1%), and 31 by Kurdish Forces (less than 0,5%). In terms of arbitrary detention, the regime is also way ahead with 6,500 women arrested, or 83% of women arrested by all parties in the conflict. With regard to the documentation of sexual abuse, the only documentation we have is of 7,500 women abused by the Syrian regime forces. We don’t have reliable data about abuse by other parties, but observation suggests the same pattern seen for killing and arrests, with a very high majority attributed to the Syrian regime. Yet, for political reasons, the public statements made by the SRSG during her visit and media coverage of these focused entirely on the abuses perpetrated by ISIS. The effects of this misrepresentation of what the women survivors of sexual violence had shared were terrible both for the women themselves and for the civil society groups supporting them. The women themselves felt betrayed. Both they and the organisations that had facilitated the meetings with the SRSG faced significant criticism within their community as the visit had been clearly used to serve an external political agenda that wrongly portrayed the regime in a positive light in contrast to criticisms of ISIS. Moreover, in its report in April 2016, the SRSG is calling to build on her visit to Damascus, ignoring a letter signed by 400 women’s and human rights organizations and activists expressing their concern about the visit and ignoring the fact that no change has been observed to the level of Syrian regime brutality against female detainees. If we are not able to protect both women and men survivors of sexual violence, the very least we can do is not to harm them or use them to support political agendas. The successful alternative to these cases of instrumentalisation has been the amazing solidarity of some international women’s organisations and individuals. An example of one person’s initiative that produced a magical impact was the support provided by Jo Cox, a British Member of Parliament, until her tragic death last year. Cox’s advocacy within the British parliament and media on the situation of both Syrian women and the wider Syrian conflict exemplified a serious and sustained engagement and commitment to bringing the recommendations of grassroots activists to the attention of decision-makers, the media and the public. She was the first parliamentarian to answer the Daraya women’s letter and led ISSG’s effort to break the siege of besieged areas. The solidarity, activism and championing efforts that Jo Cox MP provided became a transformative experience for the women in our centres and others active across Syria. 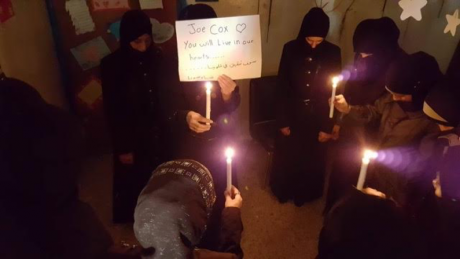 Women in our centres were traumatised by her tragic death: some wrote a letter to the late Jo Cox, some organized a silent gathering, some prepared a video about her entitled 'Jo Cox, Syrian women will never forget you', others sent a letter of support to her family. Despite the devastating conditions they are facing, Syrian women took the time to remember someone who stood in solidarity with them on a humanitarian basis. This article is the second of a three part series on women activists in Syria by Maria Al Abdeh. Read the first.